Making the most of your flat roof areas using a Rooftop SuDS (Sustainable Urban Drainage System) can make good sense when used in the correct application with the correct specification and installation. Rooftop SuDS are sometimes known as Blue Roofs which is in my opinion misleading terminology that implies that water is going to be permanently stored on the roofing system like a pond or swimming pool. This is in fact not the case most of the time; Rooftop SuDS are all about slowing the storm water to prevent a rush of water entering the drainage system. 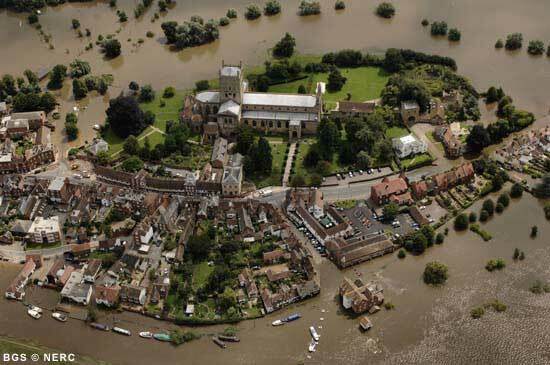 Flooding is becoming more and more of an issue these days and SuDS solutions were implemented some years ago to try and reduce the impact that building on what was previously brown or green field land has on storm water runoff. 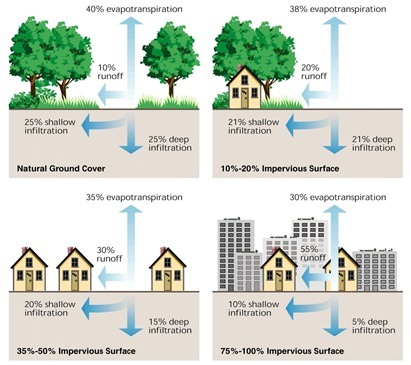 When impermeable surfaces replace the previously permeable site surface the natural soak away effect is greatly reduced causing a large build-up of water further along the chain increasing the likelihood of flooding. Runoff from a developed area should not exceed that prior to development. Runoff should not harm downstream watercourses. Any pollution generated by a development should be treated within the development before discharge. The wider needs of the community should be considered in the development of the design. 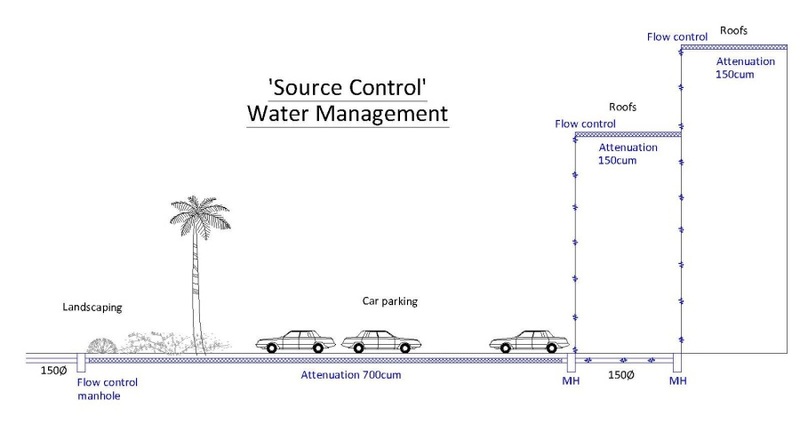 Quantity and quality of the runoff should be managed at source. Rooftop SuDS solutions can form an integral part of a building developments SuDS scheme. 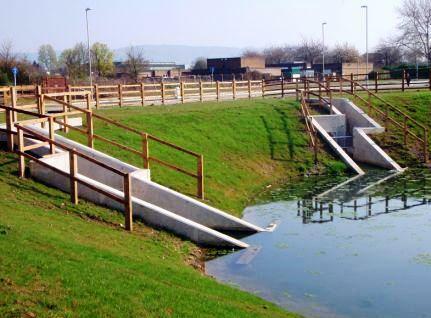 The principals behind SuDS are to slow the passage of storm water from hard standing surface areas such as the building envelope, car parking and roadways to a more acceptable run off rate. The closer this is done to the source the better so the roof area is as close as you can get on a building. Why not use the roof area as an amenity? Podium decked roofs are very common these days where the waterproofed roof construction is overlaid with paving or similar and used as a functional/recreational area. IKO in partnership with Polypipe Terrain can offer the Permavoid attenuation system. 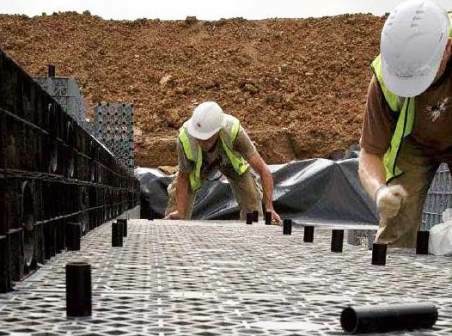 These structural interlocking units made from recycled plastic are extremely strong yet lightweight and can be layered between the Spectraplan TPE waterproofing and permeable paving to act as a rooftop attenuation tank. 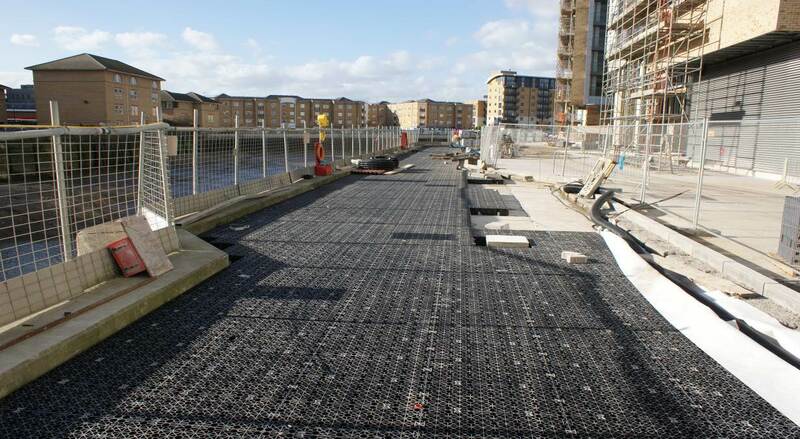 The Permavoid units are 95% void and allow the collection of the storm water, which can then be allowed to drain away via a flow restricted rainwater outlet installed in conjunction with the Spectraplan waterproofing layer. This approach allows an element of the SuDS scheme to be at rooftop level and at the same time allows the roof to be a useable area. The high strength of the Permavoid units even allows vehicular traffic for cherry pickers etc that may be needed on higher building levels. Using the rainwater collected at roof level for grey water re-use can save money as well as help the environment. Rainwater can be collected in the Permavoid units and gravity fed into header tanks for re-use for toilet flushing, irrigation or other uses. The rainwater can be cleaned and filtered by the use of geomembranes that are used to wrap the Permavoid units. Recycling rainwater is not only environmentally friendly but collecting it at roof level means less pumping required than when storing rainwater in below ground tanks. Extensive & intensive green or biodiverse roof systems are also a good method of slowing storm water runoff. 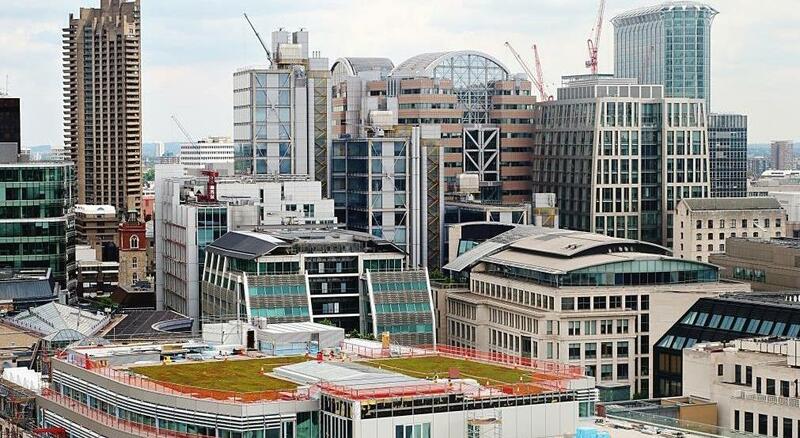 Green roof build ups can be installed over the Spectraplan TPE waterproofing layer. Typically a green roof build up consists of a protection geotextile over the Spectraplan membrane, a reservoir board that stores rainfall for the planting to feed from, growing medium and planting. Planting can typically be in the form of pre-grown sedum blankets or plug planting. Green and brown roofs are good for the environment by reducing storm water runoff and are an excellent habitat for flora and fauna in urban settings. In addition they can assist in the thermal and acoustic performance of a roof structure and provide a more aesthetically pleasing look to a roof. Installing a Rooftop SuDS system can save on project cost and resources. If the storm water from the roof area can be managed at roof level there will be a reduction in the volume of storage required below ground. 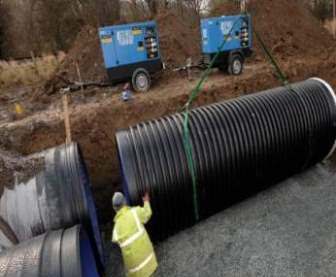 Storing storm water in attenuation tanks below ground level is costly in terms of excavation and muck-away from site; it may also be logistically very difficult to install below ground solutions on an inner city building site where space is at a premium. In some instances using a rooftop SuDS solution can enable the roof to be installed to zero falls. This saves money where screeds or tapered insulation schemes are commonly used to create the minimum roof fall. Due to the restricted outflow from the roof less rainwater outlets are required reducing the quantity and size of pipe work. As the waterproofing layer is covered where a Rooftop SuDS solution is used it is not subjected to UV rays, extremes of temperature change and is protected from potential external damage. All of these factors will extend the life span of the waterproofing membrane reducing the need for maintenance or replacement. Sustainability has become an increasingly important consideration when specifying materials. 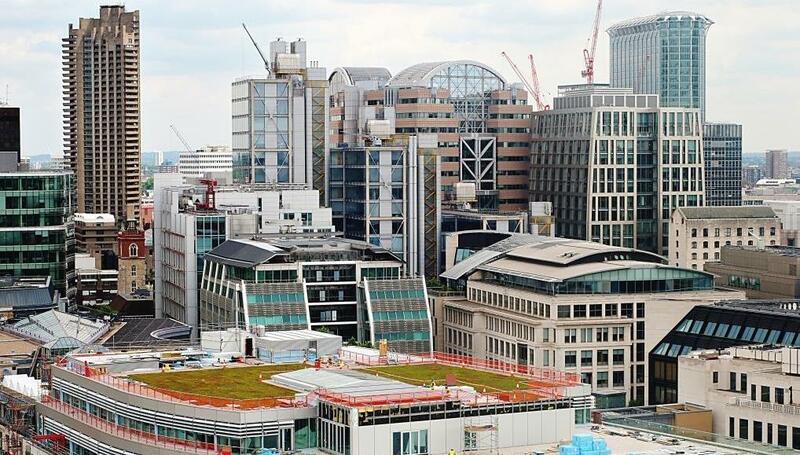 An effective rooftop SuDS solution can help with obtaining a wide range of BREEAM credits. Also any reduction in transportation to site impacts can be calculated and fed into the appropriate BREEAM calculator software by the assessor. Furthermore, if rainwater harvesting is on the roof, it can be gravity fed into internal header tanks, rather than needing to be pumped. This means a reduction in the operational energy consumed, and as such should be accounted for by the assessor in the energy consumption calculator, leading to another potential innovation credit. If you want to find out more about Rooftop Podium SuDS, why not book a CPD seminar with IKO Polymeric? 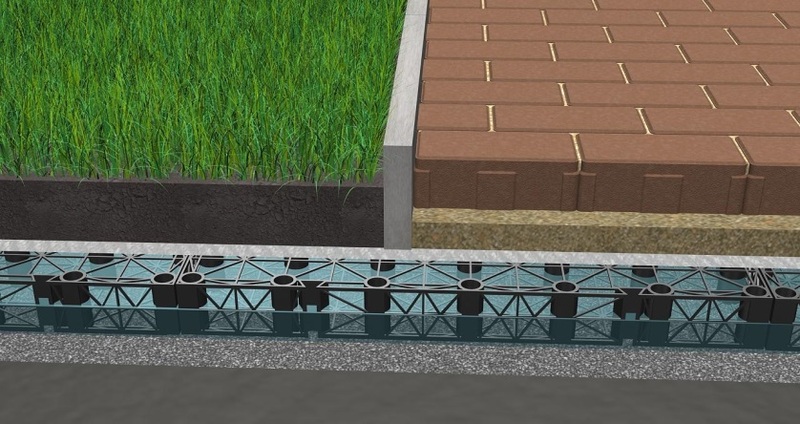 This seminar explores the concept of Sustainable Drainage Systems (SuDS), covering the fundamentals of design and the various challenges that exist. It looks at podium roofs and how SuDS can be successfully implemented as part of modern flat roofing systems. To arrange for this CPD seminar to be presented at your office or to get more information, please contact polymeric.marketing@iko.com.